Today I am going to review a line of hair care the prevents loss of hair from happening during shampooing and conditioning. This line is available at your local Rite-Aid and has the latest scientific breakthroughs in it to help hair. Read on to see if this see products are rights for you. My hair tends to be frizzy, a lot gets lost during washing, and I have breakage. I have color treated hair. This shampoo is an exclusive, invigorating blend of 12 DHT blocker, organic extracts and essential nutrients that have been clinically proven to reduce hair loss due to breakage. Niacin, Biotin and anti-oxidants work to encourage healthier, stronger hair. It fortifies and energizes hair from roots to tips. It revives damaged and distressed hair, leaving it healthier looking and smoother. Promotes a healthier scalp. Biotin encourage healthy, stronger hair. Argan Oil nourishes and strengthens hair and scalp. Anti-oxidants keep hair healthy. This product is great for thinnning air, shinier hair, volumizing hair, less hair in the drain due to brekage, damaged and chemically treated, colored hair. Science + Nature work together. Alll PURA D'OR formula combine sceince and nature to deliver transformative hair therapy. Select Certifies Organic Ingredients. No SLS (Sulfates). No parabens. No harmful chemical. Gluten free. Hypo-allergenic. Cruelty-free. Manufactured in the USA. Color Safe. It all starts with a healthy scalp. This invigorating blend of organic extract and essential nutrients fortifies and energizes hair from root to tip , reducing hair loos due to breakage. Ultra-nourishing blend of premuim oils & anti-oxidants specially formulated to effectively treat thinning, damaged and/or color-treated hair. Gentle enough for daily use. Apply to wet hair. Gently massage into scalp using fingertips. Leave on for 2 minutes to allow for deep penetration and full absorption of the essential oils and extracts. Rinse. For best results use for 3 months. Continue use thereafter. PURA D'OR does not use the chemical foaming agent SLS (sodium lauryl sulfate); if you'd like more suds from our SLS free shampoo, just use a few extra pumps! This conditioner works in synergy with the shampoo to maximize results. The daily scalp moisturizer detangles and promotes healthy, thick hair. It has 15 DHT Blockers that help reduce hair loss due to breakage. Biotin & Caffeine Tripeptide strengthens hair and keeps scalp healthy. Caffeine, Catalase and Cayenne help stimulate dormant follicles for healthy, thick hair. Apple Stem Cells encourage healthy scalp environment. Amla and Meadowfoam oils provide moisture and protection. This product is great for frizzy hair, thinning hair, hair loss due to breakage, distressed hair, damaged, chemically treated/colored hair and tangled/knotted hair. This formula includes Organic Aloe Vera which replaces water. Science + Nature. All PURA D’OR formulas combine science and nature to deliver transformative hair therapy. Select Certified Organic Ingredients. No SLS (Sulfates). No Parabens. No Harmful Chemicals. Gluten Free. Hypo-Allergenic. Cruelty-Free. Manufactured in the USA. Color Safe. It all starts with a healthy scalp. This invigorating blend of organic extract and essential nutrients fortifies and energizes hair from roots to tips, reducing hair loss due to breakage. Ultra-nourishing blend of premium oils & anti-oxidants specially formulated to effectively treat thinning, damaged and/or color-treated hair. Gentle enough for daily use. 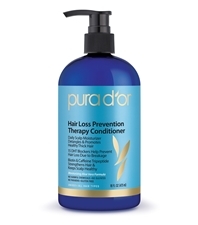 Work through wet hair following PURA D'OR Hair Loss Prevention Therapy Shampoo; leave on your hair and scalp for 2 minutes. Rinse thoroughly. Results visible after 3 months with continued use. Both of these products can be purchased at Rite-Aid. I did not get to use them long enough to see desired results, but I did notice that they helped with my frizziness, my tangles, my regular hair problems that are listed above. I liked that it was SLS free, I had no problems getting it to lather, I just used a little bit more, as directe. I noticed that my hair was not breaking off as much. Whether it was thinning less I cannot tell you. I do hope that after 3 months of use this shampoo and conditioner would help with my hair breaking off less after washing. Like PURA D'OR on Facebook: https://www.facebook.com/puradoroil; Follow PURA D'OR on Twitter: @pura_dor; Follow PURA D'OR on Instagram:https://www.instagram.com/pura_dor/.